Have followed the site for some time now and decided to add a few words. 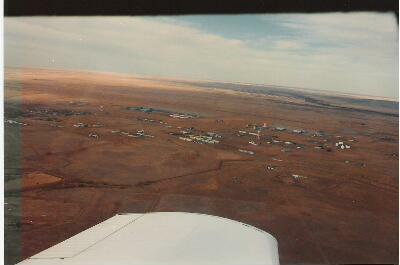 My father was stationed at GAFB from late 1959 to 1962. One of the early SAC personal to aid in the transition to a full SAC base. Our housing was 237B Oak St. We were the first to live in that unit as most of the housing area was still under construction. I remember the day the first B-52's came in. My thought at the time -- what a big plane. My thoughts still -- still a big plane!!. Have returned several times since. Once in the early 70's and again just before the base was bought by Boeing. I flew my own plane in the second time, a Cherokee 140 and rather than land on that three hundred foot wide by three mile long runway, I just landed on the ramp in front of the middle hangers! I still wonder how many touch and go's I could do in that three miles ?? Someone was asking about pictures of the actual base area. 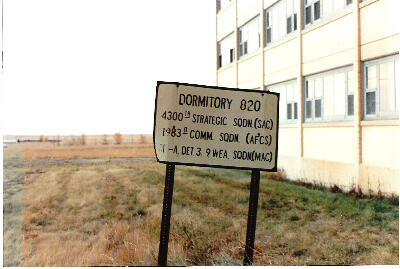 We did get quite a few of the old base complex that day. 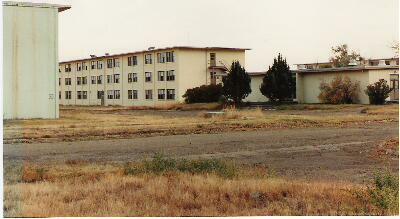 The PX ( bowling alley ) airmans club, MP HQ, enlisted club, Base Command, Post Office. ect. ect. If there would be any intrest, perhaps we could scan them and send them on for all to see. A great site, keep it up. It was a wondeful time back then, have a ton of wonderful memories. Hope to come back someday. After receiving the reply I was talking with my brother who was ten and eleven during the time we were there and between the two of us we managed to stay up far later than we should recalling many of the things that happened during our stay there. I have also spent the last day or so recalling the times and so far have more than one page of very finely written notes. It was perhaps one of the most interesting times in our lives. It seems there is little recorded about those early days of GAFB and perhaps by getting a few of the early items in print we might be able to spur a few others to knock the dust of those memory cells. I have no doubt that many of the things I will be talking about perhaps are not quite as it exactly happened but to cover all tracks I will follow the words of wisdom of the immortal Bob Hoover and say, " This might not be exactly how it happened , but this is how I remember it ." Most of the pictures I have found so far are from our trip just shortly before the base proper was purchased by Boeing, it was still called Valley Industrial Park at the time and there was no restrictions to our landing on the field or taking any pictures. We checked. I can identify many of the buildings but some I cannot. Most of the barracks shots are unnamed except for the one you will see. Almost all Air Force identification was removed from all the buildings as was any government property. The base was for all purposes , stripped. We were told at the time that many of the buildings were of a new type of construction that would allow them to be easily moved at will and this was shown to be true with the many blank foundations scattered about. Many of the buildings showed signs of abuse. The airman's club had a oak parquet floor that was poorly , half stripped up. Many of the squares were broken. It was almost like it was done in haste. Some of the barracks had been used by some kind of welfare organization and were left in a total mess. Carpeting ripped up, trash thrown about. Any damage done to any building did not appear to have been done by the weather but rather by deliberate means. Most buildings were unlocked as were the houses in both housing areas except for a few key buildings on the base itself that Boeing or someone was using. All of the buildings even those with damage could have been easily cleaned up and used with little expense or effort being put forth. The only building being used on the base and still in perfect condition was the bowling alley and the hamburgers were quite excellent too! The one shot of the theatre shows a few changes that were not there in 62. Front plywood panels were added at some later date no doubt to act as a wind break. We also have a few other shots and will send them along later tonight. 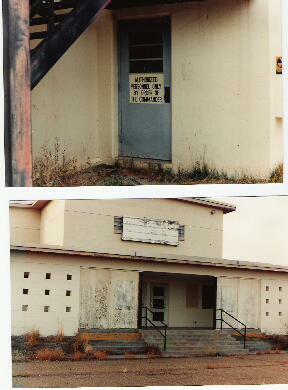 One will be of the old ticket window and another will show the concession stand. Do note the simple construction of the concession stand. As simple as it looked, it was all we had and I guess all we needed. Back then, if something was needed, you just didn't call in the civilian contractor, you called the base carpenter. Usually it was a E-2 or E-3. some did good work, some so, so. Rather than relying on civilian contractors as the military does now, most all vocations had a military counterpart and the training was supplied by the military as well. Carpenters, painters, plumbers, cooks, you name it. As I remember, we were kept supplied with all the currant movies of the time. Every now and them we will be watching something on AMC and I will remember I saw it first up there. This was considered a remote outposting so to keep moral high all things for entertainment were considered a priority. Admission was a quarter and pop and popcorn were a dime each. There was always the main feature of course but we also has the news reels and the cartoon. As I recall Mr. MaGoo ( could be bad spelling on that one ) was popular at the time so cheer on the poor ol blind guy, we did! It seems as though the theatre wasn't open every night but could be off on that one. The last time we were in the old theatre, all the seats were still in place, it was reasonably clean and still very usable. All the projectors had been removed however. My one main memory of the theatre doesn't concern a movie but rather something out of real life. It was almost the height of the cold war and tensions were very high on all sides. We had just recently had a couple of B-47 "spy" plains shot down by somebody and things were starting to get real hot over the Formosa Straights. It looked like we might go at it with the Chinese and "alerts" were a everyday fact of life. My father, as well as many other kids fathers were on constant stand by and many were on TDY to who knows where. The base had a dependent evacuation plan that required for all dependents to try to get to the gravel pits a few miles north of the base and hopefully be protected from any close blast. We all knew it was a joke as we would only have fifteen minutes at best of any warning and there was no way in the world you could hope to get than many people and that many vehicles that far away from the base in that short of time. I think even though we didn't talk about it much we all fully knew that if things did come to the worst, our fathers would not ever come back to the base and we wouldn't be there anyway. The theatre hadn't opened yet one evening and we were all standing in line when all of a sudden the sirens started going off and people started running everywhere. Uniformed personal ran, and I do mean ran to their duty station and we kids just stood there not really knowing what to do. About half a dozen AP's drove up in the old blue flight line pickups and the kids that lived the farthest were ordered in the back to be driven to there homes while the rest of us that lived closer to the housing area were told to go straight home and stay there. We did. That was only one of several times we were "locked down". A few buildings seemed to be missing in this area. I seem to recall more and there were a number of both foundations and spots where foundations had been removed and the area leveled. The goverment was experimenting with buildings that could be taken apart and transported back then. Perhaps these were some of those buildings. 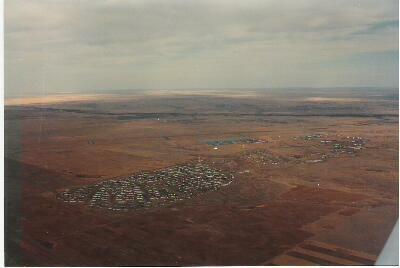 Will start with the aerial views we took coming in. I am guessing you don't have much of an idea of the base layout beyond the fence so these might help. If they transfer thru clear it should show most of the important buildings and their layout as well as the runway, christmas tree, bunkers, ect, as well as the road out to Porcupine Creek to give a true east- west relationship. You will note that there are quite a few gaps between some of the buildings, the dorms, offices ect. Back in the early 60's these were all filled in. About all that is left are some flat foundations and even some of these have been taken out. We were told even back then that many of the buildings were designed to be taken down and moved if required and it seems that a number of them were. It appeared at the time we were there that they had been removed at quite an earlier date so no doubt were taken out before the AF gave up the property. One example I think is the BX. They had just finished the bowling alley as we were leaving in about May of 1962 and it seems to me the BX was just to the east of it. There is a large flat foundation there now. As I recall the BX wasn't really big by any standards but did carry a small typical BX line. Nothing like we had in Hawaii. It was staffed with both civilians and some dependents. The barber shop was on the east side and there was a small vestibule in the middle. Just as we were leaving they were putting in a small sound system and the one song I remember , the only one for that matter, was "Corena", a popular, early rock and roll ditty of the time. I had to wait 30 years for that first hamburger in the bowling alley, do you have access to it now ? It was open and doing so-so when we were there just before Boeing bought things. Hope you do, its a great way to spend one of those long Montana evenings in the winter. I mentioned the dependents being used in the BX. Actually help was in short supply up there back then. A lot of the housing had yet been finished and if you were 16 or older you could get a excellent summer job helping the carpenters. I was only 14 at the time so missed out on that one. My mother hadn't worked since she married Dad in 1945 and got back in the labor pool by working as a secretary in the base transportation dept. Many of the dependent wives worked in many positions on the base and it actually worked out very well as they didn't have to make the ride in from town every morning. Only bad thing was when hubby rotated out, so did the wife and rotation back then was every 12 to 18 months. I called 18 places home in the first 16 years of my life and don't regret one of them. I have found it gives you a very different perspective on life. I will be sending carbon copies of this correspondence to my brother in California. Terry hadn't come along yet when we lived up there but was born at Dad's next duty station which was the NCOIC for a bomber recovery group based out of Luke AFB in Arizona. The recovery area was Winslow AZ. There again, this was a typical AF thing during the cold war. OK, another. We had turned into a downwind, still a bit high and quite a ways out. This gives a good layout of the base proper. If you look close, directly under the hangers on the left can be seen the theatre. Directly under the lighter colored hangers is the bowling alley, the BX was just to the right. The darker colored areas around the water tower area are the foundations and where foundations were.